Several years ago, we lived across the street from a family that went all out decorating for Halloween. In addition to fake witches, ghosts, and other spooky things, they also had a pair of giant yellow eyes plastered on their second floor windows. It was downright creepy. And it was unavoidable. Every time I looked across the street or left the house those huge, evil glowing eyes stared back at me. They stared back at my children, who were still a little too young to separate fantasy from reality. As Christian parents, we are squarely confronted with the question of what to do with October 31st. 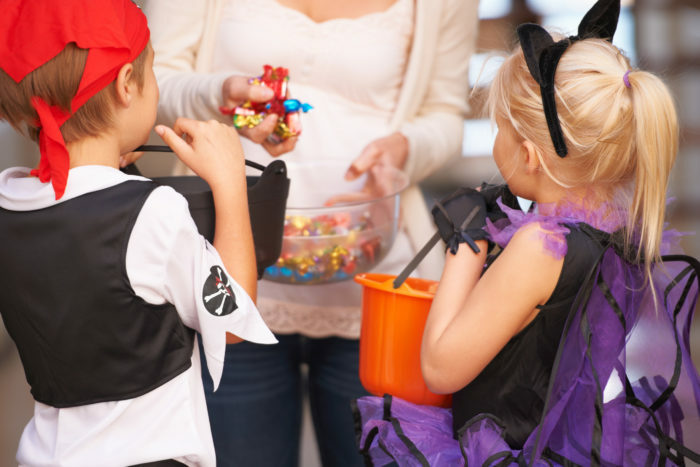 Do we let our kids go trick-or-treating? Do we participate in any of the seemingly benign Halloween festivities around us? Do we huddle in our homes in fear? Or do we just ignore what’s happening in the culture and go about our lives? The origins of Halloween are actually not pagan, contrary to popular belief. As early as the mid-second century, the church remembered and celebrated its martyrs, at times dedicating special days to commemorate their faithfulness. Since the number of special days increased, the idea of having a common day for all martyrs gradually evolved. The earliest known celebration of “the Feast of All Martyrs” began in the mid-300s. Over time, this celebration started to embrace not just martyrs but all departed saints, celebrating Jesus’ victory over death by remembering these faithful believers who had entered into glory. Then in 610, Pope Boniface IV declared May 13th “All Saints’ Day.” Over a century later, this celebration was moved to November 1st, making October 31st All Saints’ Eve. They also referred to it as All Hallows’ Eve, which then eventually became “Halloween”. By knowing the original intent of the holiday, we ourselves can use October 31st as an opportunity to celebrate eternal life, not the darkness of death. Today, Halloween is associated with a dark, foreboding night. The Catholic tradition of All Saints Day and Samhain, a Gaelic harvest festival celebrated at the same time, eventually combined and boom- the evening of October 31 became one that focuses on, and even endorses, evil. Instead of pretending they don’t exist, I’ve acknowledged the dark parts of the holiday to my children and told them that we will not celebrate or make light of the occult. So for us, that means not dressing up as witches, vampires, zombies, ghosts, etc. and participating in haunted houses, scaring others, or decorating our home with scary/gory things. While we’re not completely opposed to trick or treating, we typically go to our church’s fall festival on the night of Halloween where our kids dress in story book character or hero/princess costumes and collect candy. We feel that this is just a safer alternative. Admitting that October 31 has been hijacked by the devil and used for his purposes is really the only way to actually redeem it. The holiday itself is not inherently evil. Our goal shouldn’t be to throw out all practices that contain even a hint of Halloween, but to abstain from glorifying evil. Personally, I don’t know why we make such a big deal out of the evils on Halloween while ignoring demonic influences the other 364 days out of the year. We think nothing of plopping our preschoolers down in front of Sofia The First and allowing our teenagers to watch Disney’s Descendants or read Harry Potter, media that portrays witchcraft and sorcery as morally neutral, even fun. Deuteronomy 11:9-14 warns God’s people to have nothing to do with such things. We create gray areas for divination, fortune telling and magic when we allow our kids to be entertained by sources that paint these elements as essentially harmless. Yes, let’s take a stand against the evil practices of Halloween. But let’s also take a stand against demonic elements in our children’s books, movies, schools, etc., and the evil that we call “good” in our own lives. Halloween is actually a perfect time to discuss the presence of evil with our kids, precisely because it highlights that presence. Scary decorations, costumes, and traditions take the concept of evil out of the abstract for our children and illustrate forces in the world bent on killing, stealing, and destroying. They serve as a reminder that real demons are just as real and even scarier than the trick-or-treaters. This can also be a great opportunity to share that while we shouldn’t celebrate or make light of evil, we do know that it can and has been overcome. Halloween highlights the problem of evil, but we can point our kids to the solution: Jesus. We should talk about Halloween’s darkness and depravity in a way that emphasizes the light of Christ all the more. And in a way that connects the depraved nature to a life apart from Him. Children need to be taught and then reminded regularly of their desperate need for Jesus, because of the wickedness in their own hearts. So let’s not avoid October 31st at all costs, and miss the opportunity to share what makes the Gospel so relevant! 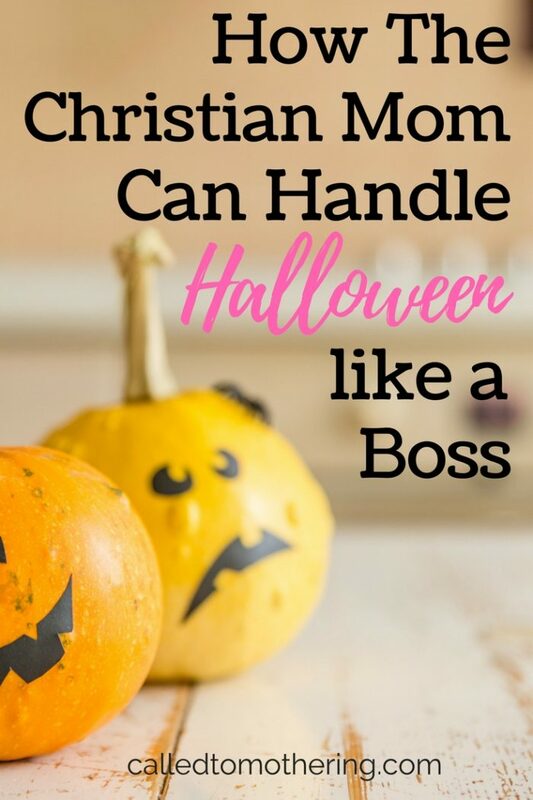 Christian moms can enjoy Halloween with their kids, not because they are reveling in evil, but because the holiday serves as a powerful reminder that Christ has conquered the devil. I just learned that the tradition of trick or treating started with children going door to door asking for soul cakes which were small currant cakes with saffron and nutmeg. The idea was the children promised to behave and were given a cake to seal the deal so to speak. The devil has sure used Halloween to divide Christians, hasn’t he? I hope more people will listen to your balanced view. You’re amazing! I LOVE this! You said so perfectly how I feel. I really did think Halloween was a pagan holiday, but I thought it just is what you make it (we wouldn’t allow zombies, witches, gore, etc either) but I’m happy to know there’s more history behind it than i knew! I used to allow my girls to watch Sofia the first until one day I heard something about an Oracle…i was shocked! Anyway, thanks for this well written article! Aw thanks, Rachel! It was fun to do a bit of research on the holiday and learn that it actually has Christian roots. The beginning of the end for Sofia The First in our house was when they featured an episode with a “good” witch. I didn’t want my kids thinking witchcraft was anything cutesy or innocent. This was such a great article! I love the way you mentioned how we need to redeem the holiday since it was originally a Christian holiday. My husband and I have decided to celebrate All Saints Day but to include trick or treating with that (no evil or scary costumes). I like the way you also included the importance of using the evil the rest of the world often celebrates as a teaching moment for our kids about the devil. Thank you Laura! That’s a great idea to celebrate All Saints Day with trick or treating. I’m so grateful that Jesus can redeem even the darkest things. I get that question too, and I love the way you handled it with your kids. It has been very disconcerting that so many children’s shows, movies, and even books contain elements of the occult and make them appear harmless. I’m so glad for all the wonderful Christian alternatives out there! Oh my goodness! This is SO good! Marisa, as usual, I fully agree with your stance. We, too, are firm about not allowing witchcraft or divination to be a benign subject for our family. I have found that most people believe this to be a very radical stance, but that’s okay! Without judging others, we can stand firm in conviction and share truth in love with our children and those around us! This is one of the best posts on the subject of Christianity and Halloween I’ve seen. I have trouble with the stay away from Witchcraft part of Christianity since I’m brand new to it and I was Pagan before as is my husband. It’s not as easy as it might be for you. But regardless, I always thought there was a few ways for Christians to let their kids have fun on Halloween without going against their religion and I think you highlighted that here. Thank you Kathleen! The subject of Halloween is a delicate one for so many Christians, and I wanted to present a balanced view without the hysterics. There are certain things that all of us find difficult to leave behind once we become believers. Finding strength in Christ instead of ourselves helps overcome those temptations! “Admitting that October 31 has been hijacked by the devil and used for his purposes is really the only way to actually redeem it. The holiday itself is not inherently evil. Our goal shouldn’t be to throw out all practices that contain even a hint of Halloween, but to abstain from glorifying evil.” I love this!! thanks for sharing more of the history behind Halloween. I knew some of this, but not all of the information that you shared. I SO appreciate how you brought up the other demonic issues we deal with all the time, such as Harry Potter, Sofia the First, etc. I simply appreciated the heart if the entire article. Thank you! ? I enjoyed reading through this post. As Catholics, my family and I participate in trick or treating and in All Saints Day so I appreciate you talking about the Catholic origins of Halloween 🙂 Trick or treating can be just a fun fall event for families and my daughters enjoy dressing up as princesses or nursery rhythm characters. We pretty much avoid all the scary stuff. For All Saints Day, our local area has what they call “the Superbowl of the Saints” where kids can dress up as their favorite saint and play games together as a big group. So it’s fun to be able to celebrate both holidays in a wholesome way. I agree that trick or treating can just be another fun fall family thing, as long as we’re not dressing up in frightening or dark themed costumes. The activity in and of itself isn’t evil. I’m so glad you appreciated the post, Hannah!